A selection of items from ATA chapters that dont fit into any other categories! O/B Landing: (Classics only) 3 position switch: OFF - EXTEND (off) - ON. This was modified from a 2 position switch in 1969 to eliminate distracting light reflections during extension in clouds. The lights are located on the outboard flap track fairing. The same modification also introduced the gang bar which operates the inboard & outboard lights. Retractable Landing: (NG only up to 2016) Replaces the outboard landing lights on the earlier series. 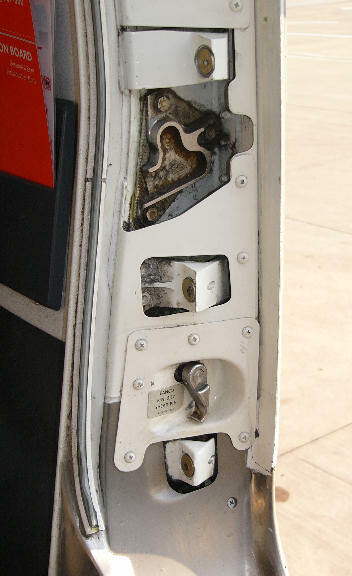 These are located on the fuselage just beneath the ram air intakes. These were removed in 2015 due to excessive stone damage, wear on the motors and the improved performance of the LED lights. Note Use of both of these lights should be avoided at speeds above 250kts due to excessive air loads on their hinges. I/B Landing: Known as fixed landing lights on the NG. These are located in the wing roots, usually used for all day and night landings for conspicuity. The landing lights have been LED since late 2015. R/W Turnoff: Also in the wing roots, normally only used at night on poorly lit runways. Taxi: Until 2015 this 250W light was located on the nose gear, for LED equipped aircraft the taxi lights are located in the wing roots and are much more effective. On later models it will switch off automatically with gear retraction. Logo: Are on each wingtip or horizontal stabiliser and illuminate the fin. Apart from the advertising value on the ground, they are often used for conspicuity in busy airspace. 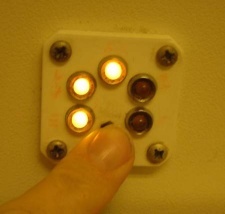 Position: Depending upon customer option this can be a three position switch (as illustrated) to combine the strobe. Strobe & Steady / Off / Steady, where steady denotes the red, green & white navigation lights. The three Nav lights are no-go items at night. Strobe: (Not illustrated) Off / Auto / On. Auto is activated by a squat switch. They are also in the wing tips and are very brilliant. This gives rise to great debate amongst pilots about when exactly they should be switched on as they can dazzle other pilots nearby. many people choose to put them on as they enter an active runway for conspicuity against landing traffic. 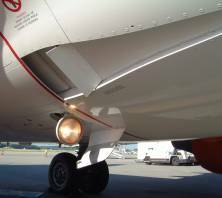 Anti-Collision: Are the orange rotating beacons above and below the fuselage. They are universally used as a signal that the engines are running or are about to be started. They are typically not switched off until N1 has reduced to below 3.5% (or N2 below 20%) when it is considered safe for ground personnel to approach the aircraft. Wing: These are mounted in the fuselage and shine down the leading edge of the wing for ice or damage inspection at night. Wheel Well: Illuminates the main and nose wheel wells. Normally only used during the turnaround at night for the pre-flight inspection but must also be on to see through the gear downlock viewers at night, hence they are a no-go item at night in all but the NG's. There is also a switch for the main wheel well light in the port wheel well. There is a 60 US Gal tank (227 litres) behind the aft cargo hold for potable water. This serves the galleys and washbasins, but not the toilets as they use chemicals. Waste water is either drained into the toilet tanks or expelled through heated drain masts. The tank indicator (-3/4/500 version shown left) is located over the rear service door. Press to test, indications are clockwise from 7 O'clock: Empty, 1/4, 1/2, 3/4, Full. The NG has an LED panel that is always lit (below) for both potable water and waste tank. May be operated from either internal or external panels. The internal panel requires the forward entry door to be at least partially open. Both panels have normal and standby systems. Normal requires AC and DC power, standby only requires DC. External standby system power comes from the battery bus and so does not require the battery switch to be on. 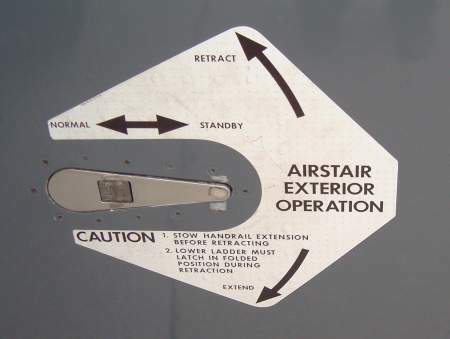 On classics, if the airstairs will not operate, check the striker pin (see photo below) at the bottom left of the door frame. Move it about and ensure it is vertical, this will often cure the problem. They have a tendency to freeze in position on long flights were the doors have got wet. Caution: The handrails must be stowed before retraction. The use of standby system from either panel will bypass the handrail and lower-ladder safety circuits. Note that the NG has an red covered EMERG switch underneath the airstairs for emergency retraction, this also bypasses any safety circuits. Maximum wind speed for airstair operation: 40kts. Maximum wind speed for airstair extended: 60kts. Airstairs should not be operated more frequently than 3 consecutive cycles of normal system operation within a 20 minute period. Note that there have been at least 4 cases of children falling through the gaps in the rails of the airstairs FAA SAIB refers. In the drive for self sufficiency, these were fitted to about 120 737-200's. They were much more complicated than forward airstairs as they folded in two places and took the door downwards with them. If you have ever considered the forward airstairs to be temperamental then you would not get on with aft airstairs. There were several reports of inadvertent deployment and even two instances of them extending after take-off. Boeing say that after one of the in-flight deployments the crew landed with little control problem and apart from some scuff marks on the foot plates where they made contact with the runway, they were still in working order after the event! Underneath NG Airstairs - Notice the red guarded MAINT switch. Amber light will illuminate with Master Caution "DOORS" when a door is unlocked. Air Stair must be fully stowed, even if fwd entry door is closed. Equip is for E & E bay and Radar bay. The sequence of door lights is changed in the NG's to accommodate the left and right overwing annunciators. They are located between the fwd & aft entry/service door lights. On the NG, it is not uncommon to get an overwing caption illuminate for a fraction of a second as you start the take-off run. This is due to the overwing exit automatic locking function being slightly slow. Maximum wind speed for door operation: 40kts. The doors may remain latched open in winds of up to: 65Kts. The following table shows the increased radius of turn of the wing and tail relative to the nose during a turn with full nose wheel steering applied. This table shows that turning in a 737-600 is probably most hazardous because the wings and tail turn out much further than the nose. 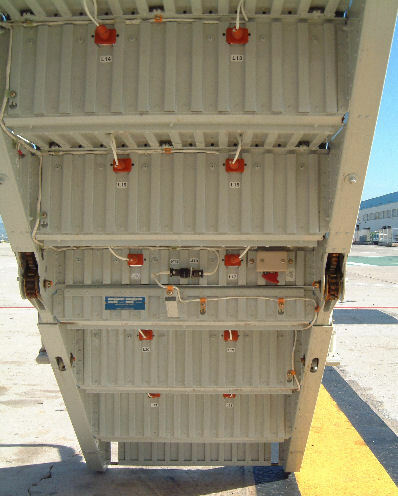 Both cargo holds are designed to confine a fire without endangering the safety of the aircraft. A cargo fire detection and extinguishing system may be fitted as an option (see Fire Protection). NB If a hold ceiling light lens cover is broken or missing this is a fire hazard and the bulb should be removed if the cover can not be fixed. Class C: Compartments that contain both the smoke-detection and fire-suppression of a minimum initial concentration of 5 percent Halon throughout the compartment to suppress any combustion to controllable levels. Thereafter, the system must sustain a minimum concentration of 3 percent Halon for 60 min to prevent reignition or spreading of the combustion. Class D: Compartments that depend on oxygen deprivation to prevent and suppress combustion. Class E: Compartments that have a smoke-detection system alert the flight crew within 60 sec from the time smoke first appears in the compartment. The holds are sealed and pressurised but have no fresh air circulation. They have no temperature control but are heated by exhausting cabin air around their walls. The forward hold also has additional heating from E & E bay air. Live cargo can be carried on either cargo compartment but the forward hold is preferred. For a technical questionnaire on this subject, click here.